Happy hot 4th of July...so happy to be in where is is cool! 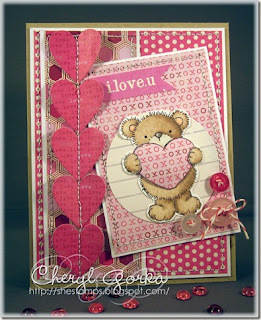 I decided it was time to CASE a card that was made by Cheryl at http://shestamps.blogspot.com/. I love her work! When I saw her uber adorable card I fell in love with everything about it. Isn't it so sweet...particularly love all those xoxos. The bear is a free digi image from http://spyder-spyderscorner.blogspot.com/. I changed up the buttons with brads to make it more mail friendly. There were two things that were challenging to me, the first was the use of pink and the second was the tilt of the image (I always tilt to the other way). So good to work outside my comfort zone. Anyway...I need to make start a second card...My sis will be celebrating hers soon. Very sweet. Love them both. awww, such cute cards!! Spyder makes the cutest digis and you've really brought this bear to life! Love the paper pieced heart! AWWW two adorable cards. Love those little bears and those hearts. Just great cards. So Cute! Love the stitching on the heart border. Hi Linda! I can see why you CASEd Cheryl's adorable card; yours turned out GREAT! Love that layout and the stitched-down hearts. I may have to CASE yours!! Your cards are so cute. Love the little bear and the stitched hearts.